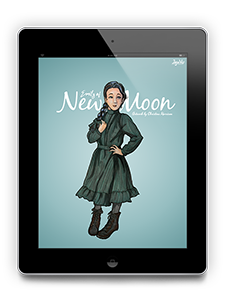 Deja Vu Dimensions is excited to bring you Emily of New Moon, a cinemagraphic novel for the web and eventually for virtual reality. This experience has begun production and is available to freely view below as it is completed a section at a time. Upon completion of the artwork the graphic novel will be assembled and made available for purchase as a Virtual Reality Experience. Feel free to follow along below and on our production blog.